The Pixel has very few weaknesses when it comes to image quality, but It does suffer from some inconsistency in repeated autofocus, and artifacts can appear in low-light shots. 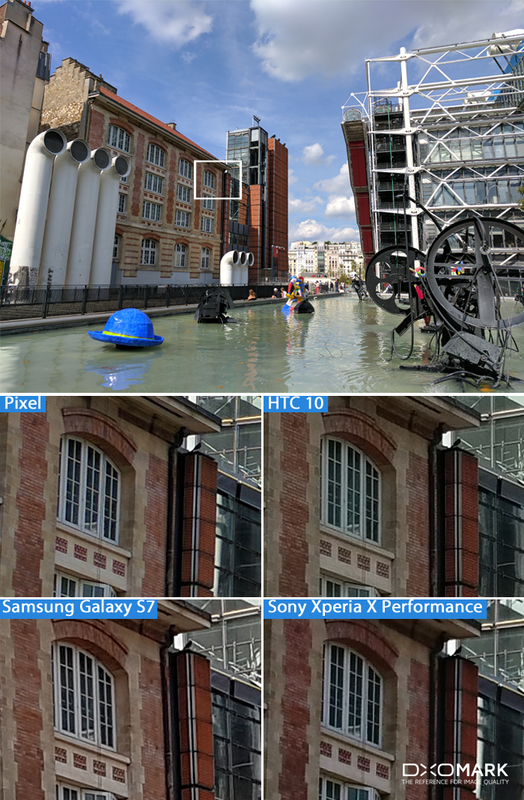 The Pixel racked up excellent results in our Video testing, consistent with other top-scoring smartphones. The Pixel’s 12.3MP main camera is paired with a fast f/2.0 lens. Autofocus is provided by a combination of laser detection (LDAF) and phase detection (PDAF). The Pixel can also record 4K video at 30fps, and 1080p video at up to 120fps. The Pixel produced some of the most natural-looking outdoor images we have ever seen in our tests. With rich colors, life-like white balance, and excellent rendering of both highlights and shadow details, images of landscapes and urban scenes alike are pleasing to the eye. Detail preservation is excellent, and exposures are consistently good. 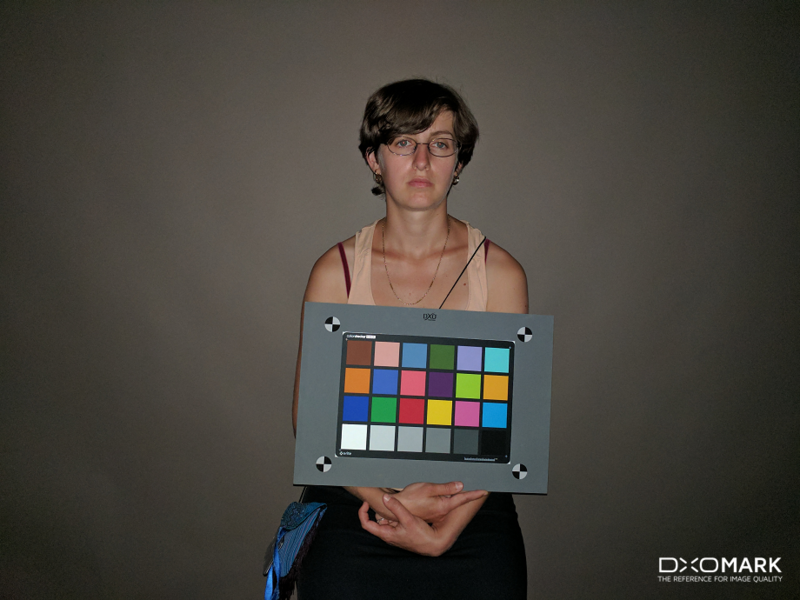 The Pixel is one of the best devices (maybe the best) we’ve ever tested for its ability to render poorly-lit scenes with low noise, while retaining good detail – even in 10 Lux and below. Its hybrid autofocus, using both laser- and phase-detect pixels, is also accurate in low-light conditions. 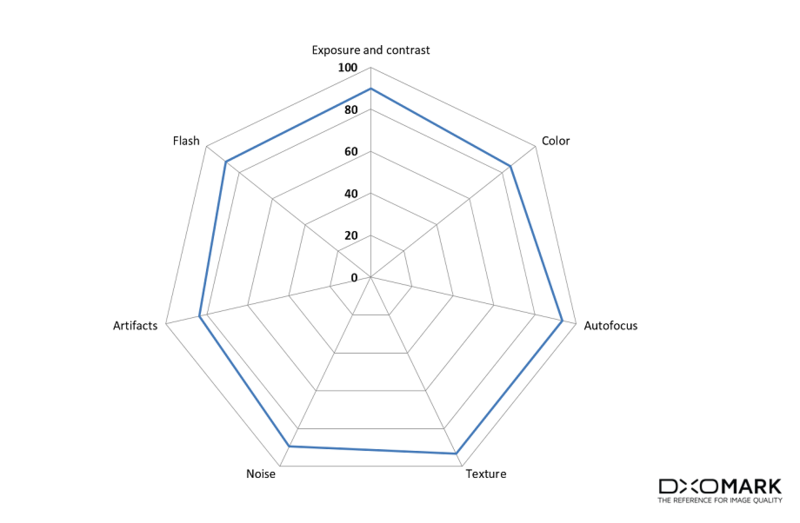 The Pixel’s flash capability is also one of the best we have tested. 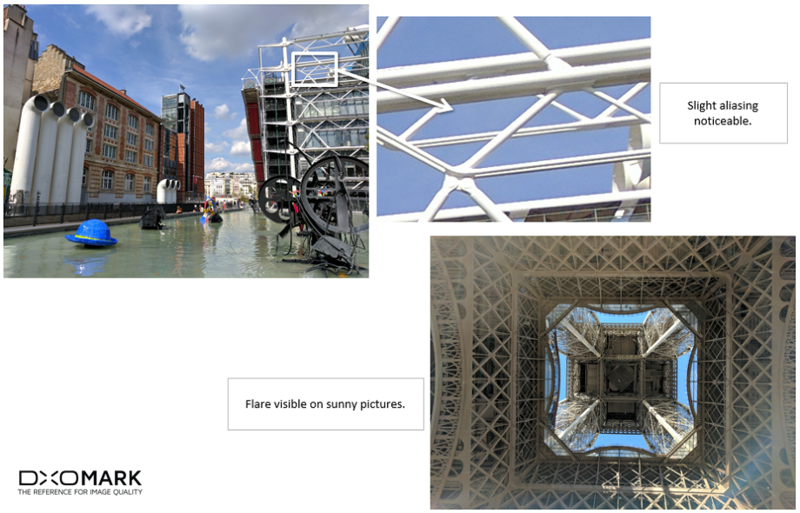 It is stable from frame to frame and allows for excellent rendering of details in flash images. The Pixel produced overall excellent video results, with one of the best stabilization systems we’ve tested. Motion artifacts are visible only in low light, due to the longer shutter speeds needed. 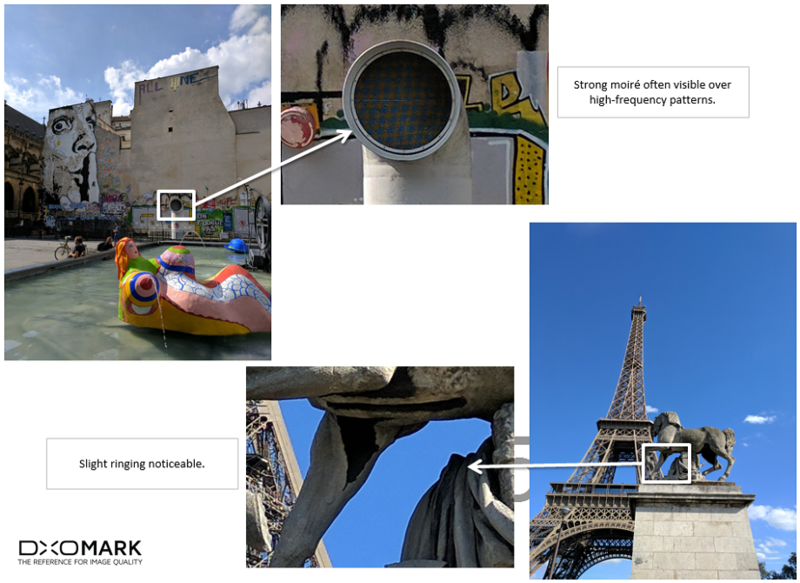 Pixel’s biggest innovation is an enhanced version of Google’s HDR+ multi-image capability. 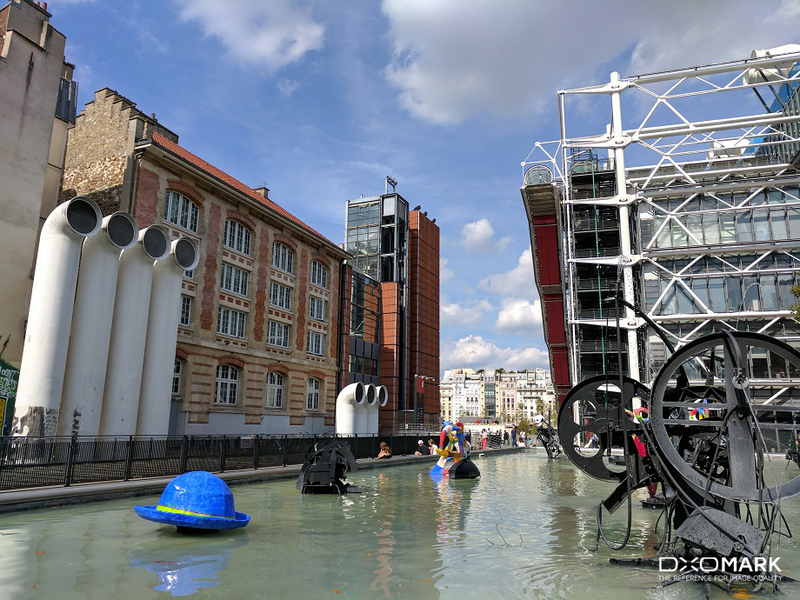 First introduced in some of its Nexus phones (see our Nexus 6P review), the upgraded version in the Pixel combines several RAW images in near-real time to create one enhanced JPEG image with lower noise and extended dynamic range as the final result. 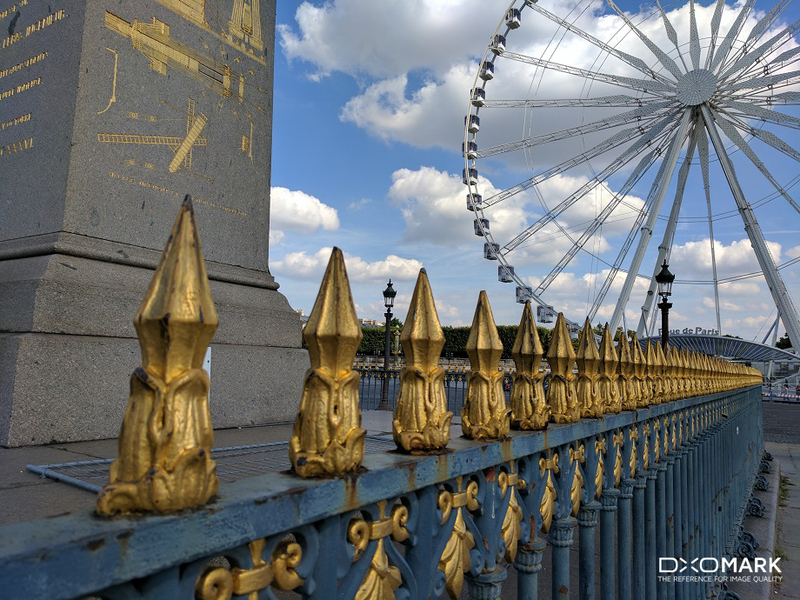 The Pixel activates the Google Camera app’s Auto HDR+ feature as its default camera mode. The Pixel determines whether it needs to use multiple images to get lower noise and better dynamic range, then switches HDR+ on as needed. It also does a good job of detecting rapid motion in the scene, avoiding the ugly artifacts often found in images from other HDR systems. Google certainly isn’t unique in providing clever software for assembling multiple images, as Apple, Motorola, and Sony have all done something similar – but the Pixel pushes the capability further than we’ve seen before. 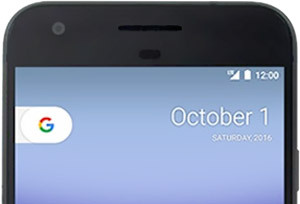 HDR+ was introduced with the Nexus 6P last year, and has been included in Nexus models since then, but the Pixel’s increased computing power extends the feature’s functionality and performance. 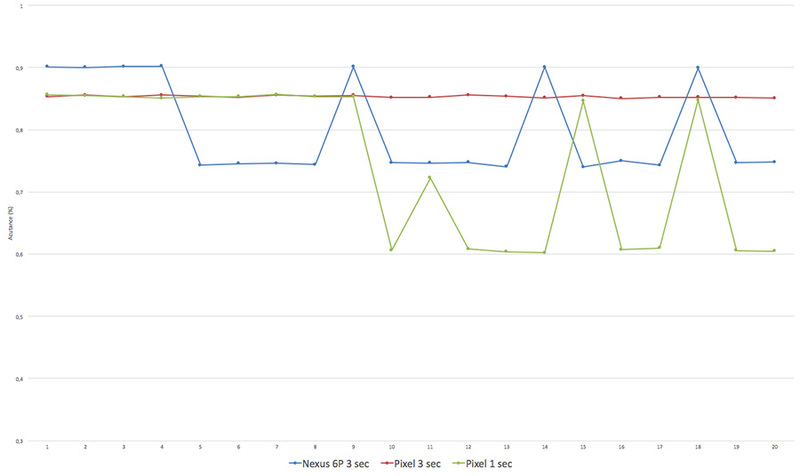 We took a shot every second for more than 10 seconds and compared the level of image quality provided for each shot. 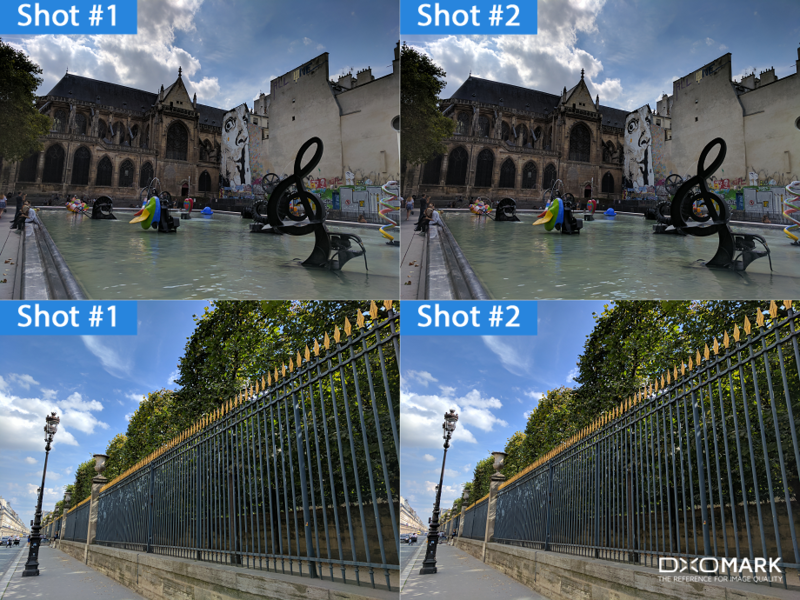 If image quality went down significantly, it meant that the smartphone didn’t have enough processing power to provide an HDR+ picture and instead provided a traditional single-frame image. 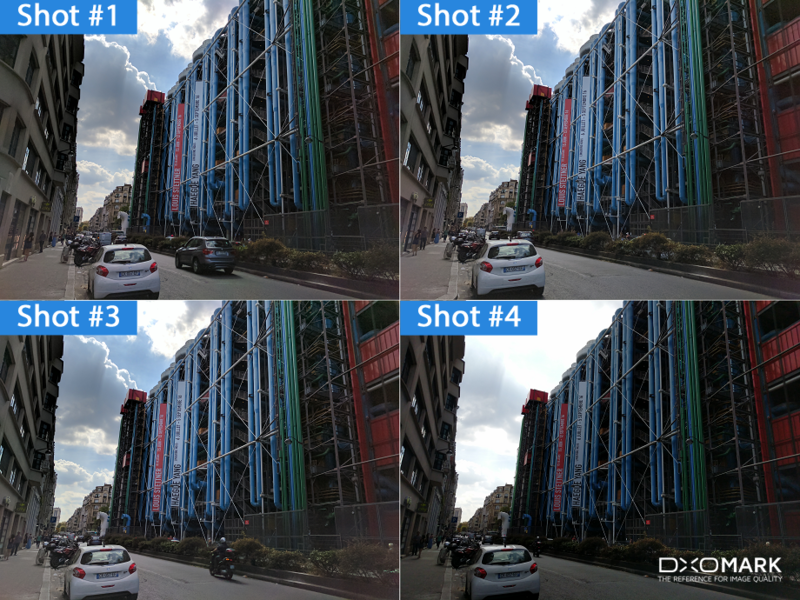 The Nexus 6P was unable to keep up, but the Pixel could capture as many as 9 HDR+ frames before falling back to a single-frame image. 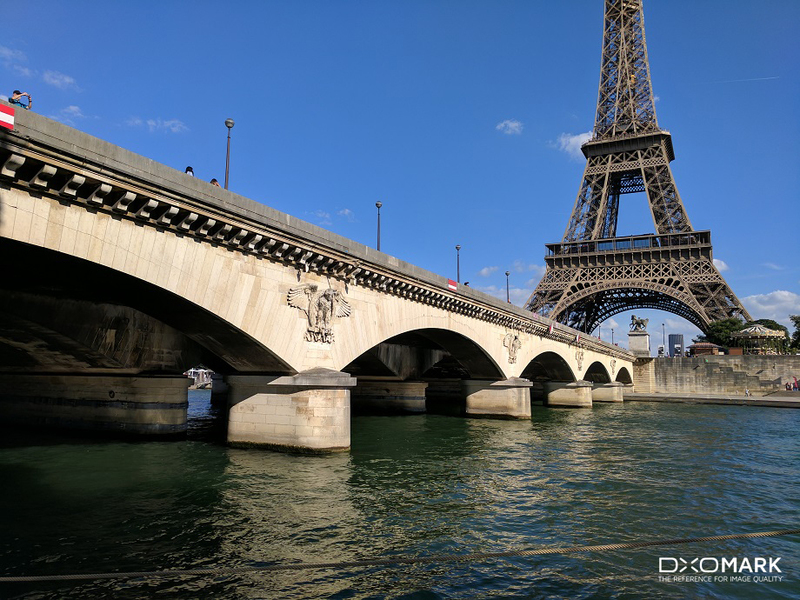 If we slowed down to one image every 3 seconds, the Pixel was able to provide HDR+ pictures indefinitely, while the Nexus 6P failed to use HDR+ after 4 images, meaning that the Pixel has more consistent image quality when shooting multiple images. 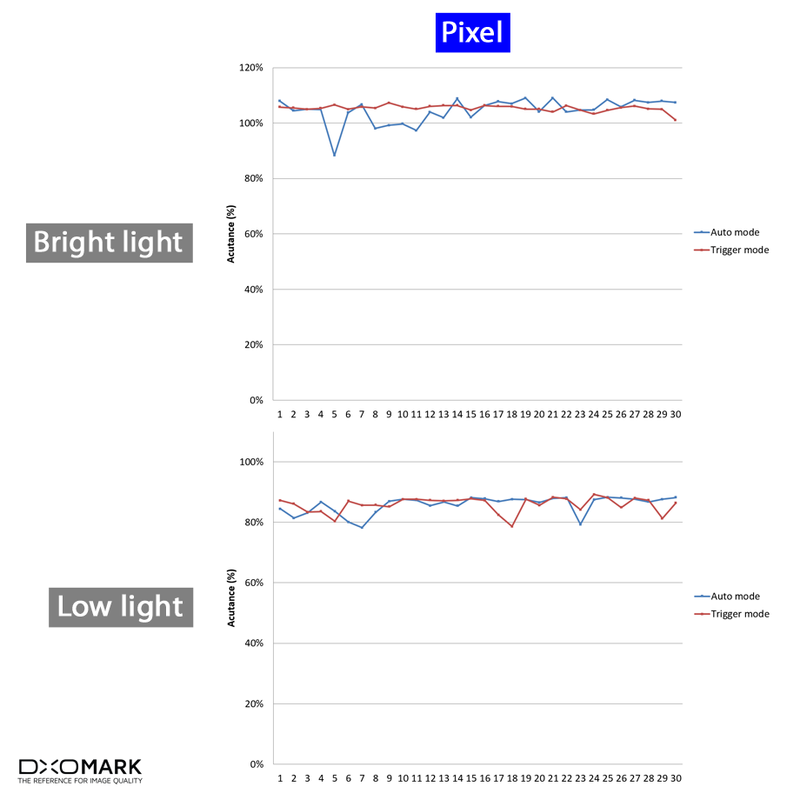 The Pixel is an all-around great performer here, in conditions ranging from bright outdoor scenes to our darkest lab conditions. 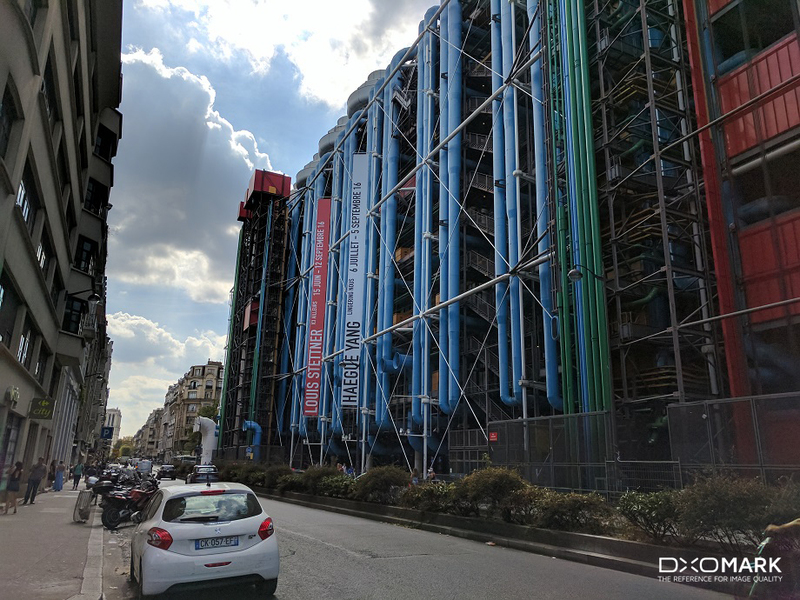 Overall, the Pixel did extremely well in capturing our natural test images, typically performing as well or better than other current flagship models. 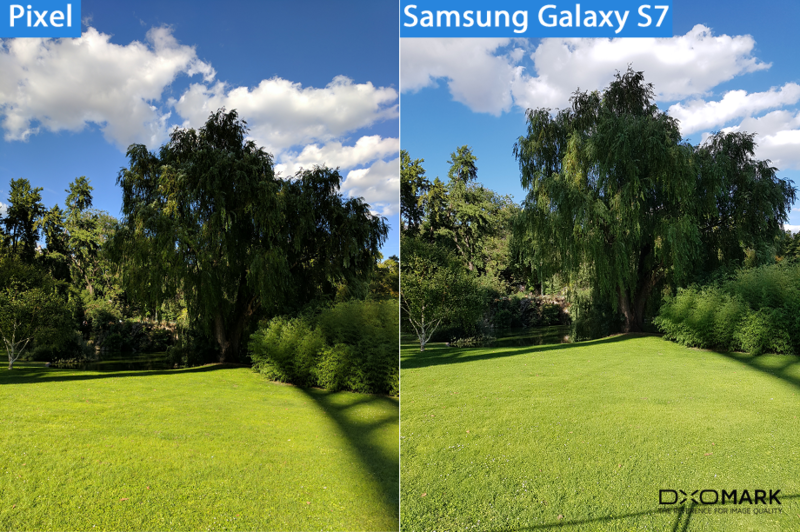 However, on our greenery test scene below, it didn’t perform as well as some of the other flagship phones, as it lost details in the shadows. Even in low-light conditions (tested down to 5 lux) the Pixel’s camera provided accurate exposures and evenly-lit images with little light falloff near the edges. 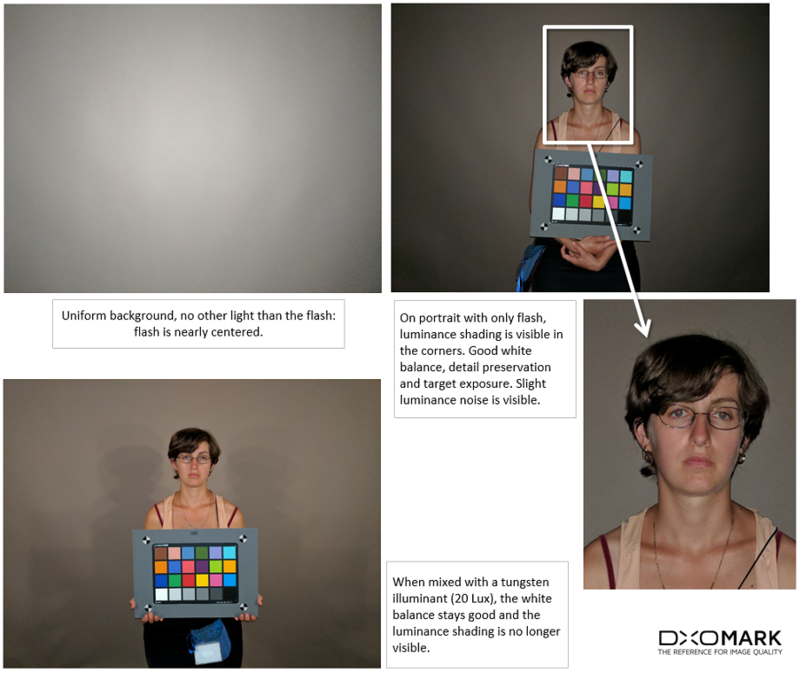 Good color starts with accurate white balance – otherwise the entire scene will have a color cast. The Pixel excels here, with remarkably good automatic white balance in almost all conditions. While white balance was excellent overall, the Pixel created a slight yellow, but acceptable, color cast in one outdoor scene. We’ve added HTC 10 and Samsung Galaxy S7 shots for reference. Image colors in outdoor scenes are vivid and pleasant. Sometimes there was a small amount of color shading, but it was barely visible. In low light the color shading is visible, with a slight tendency towards pink in the center and green in the corners. Overall, the Pixel’s autofocus is both very fast and very accurate. Its only failing is that it was inconsistent in our repeated autofocus tests, with some frames relatively far out of focus. The Pixel does better in outdoor scenes at preserving detail than any smartphone we’ve ever tested. 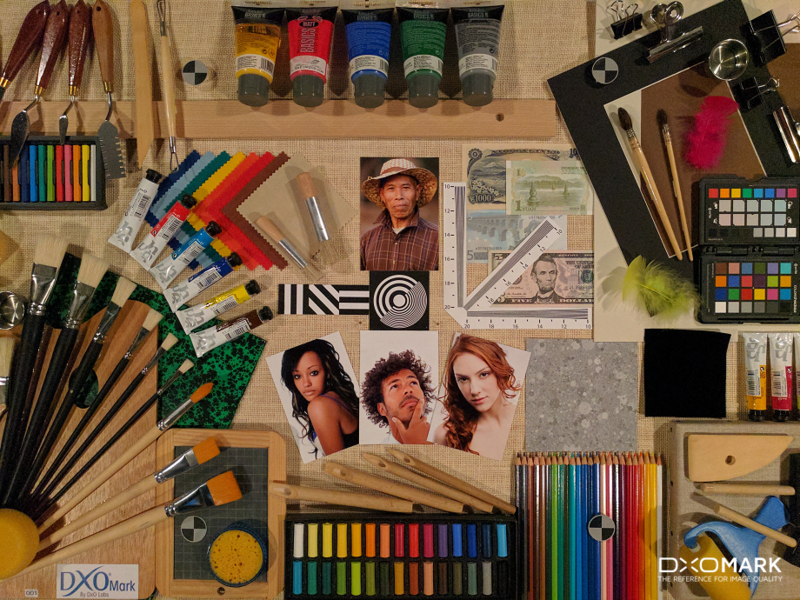 Thanks to its HDR+ technology, detail preservation is also remarkably good in low light. 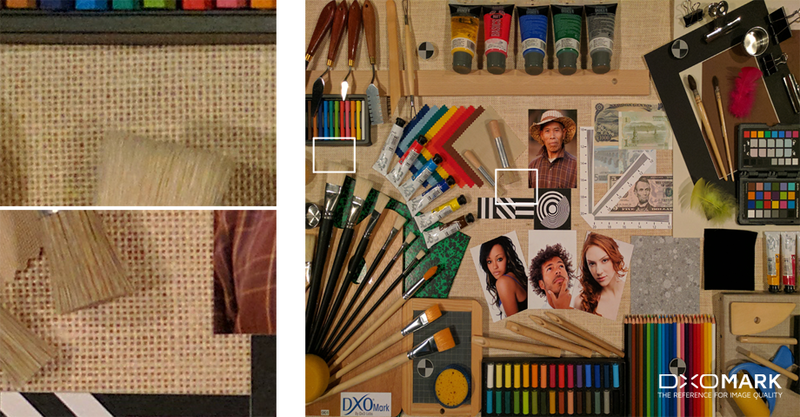 The Pixel does produce slight luminance noise in outdoor scenes, along with chromatic noise in lower light conditions. 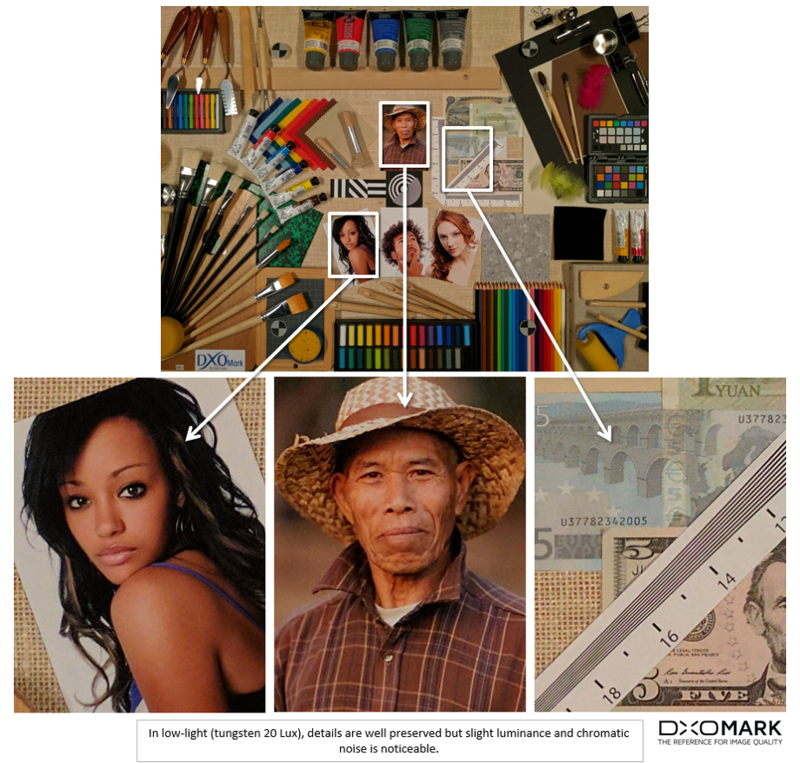 Overall, though, the image noise is some of the lowest we’ve tested. One big drawback of rendering all image details is that doing so often adds a lot of annoying artifacts to the photo. With the Pixel, Google has clearly opted for maximum detail preservation, but also succeeds in limiting artifacts. For example, moiré patterns can be quite visible in heavily-patterned subjects such as the one in our outdoor image below. Similarly, ringing is sometimes visible on high-contrast edges. The Pixel’s high-quality (CRI of 90) dual LED flash provides generally even illumination that is nicely centered in front of the camera lens. When lighting portraits, some light falloff around the edges is quite visible, but this is typical of even high-end smartphones. While balance was accurate not only when using just flash, but also in mixed-light scenes with an added Tungsten light source — an impressive achievement. With very impressive stabilization, accurate autofocus, and generally good quality, the Pixel produces excellent video under most conditions. Its Video score of 88 is tied with the Samsung Galaxy S7 and the Sony Xperia X for the highest ever achieved. We found some relatively minor issues when recording video with the Pixel. There is slight motion blur in low light while walking, as the show shutter speed overwhelms the stabilization. There can also be some jello effects from the rolling shutter, which is very common for smartphones. Finally, there is some chromatic noise and color shading under low light, but not enough to seriously affect the Pixel’s score.